Horse trainer Michaela Bancroft's husband is divorcing her for a twenty-two-year-old beauty queen. Stunned, Michaela is trying to rein in her life when she finds her Uncle Lou murdered in his prize stallion's stall. As she fends off debt collectors - and her ex-husband's renewed interest in her - Michaela begins to suspect that the killer may be someone close to her. When she'd nearly run off the road the night after her uncle's funeral, Michaela is convinced she's on the fast track to becoming the next victim. 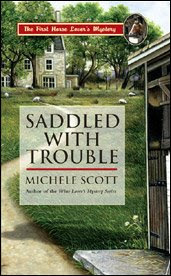 The equestrian world comes alive in Saddled With Trouble, an enjoyable light read full of red herrings and fun. I have horses so this appealed to me and while the characters are all adult, I think young girls who love horses will have an especially good time with this book. Our heroine, already dealing with her unpleasant divorce, is hit hard by the death of her favorite uncle. When it comes to light that he was murdered, Michaela goes on a quest to find the truth. She's an amature sleuth but gets some help (and romantic attentions) from the detective on the case. So there's a little romance thrown in, along with the mystery, danger and suspense. Scott gives us enough suspects that the reader is guessing who-dun-it to the very end. Saddled With Trouble is a fun light read, and those who enjoy a look into the world of horses will appreciate it even more! 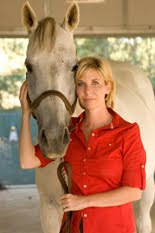 This is the first in the Horse Lover's Mystery series and she also has a Wine Lover's Mystery series where the stories take place around a vineyard in Napa Valley. She also has a new MG fantasy called Zamora's Ultimate Challenge. I haven't read it but you can check out more on her website. I met her at a conference (where I bought the book) and she's a wonderful lady as well as a talented writer. We have a copy of Saddled with Trouble available in our MegaBook Giveaway. Go to the contest post if you'd like to enter! Only ten more followers are needed for us to add two more potential winners (that would make it 15!) and more books to the pile! Good Luck! This sounds like a really great book!! I love the ominous cover of the second one. they were mostly centered around teenagers though, so this adult-centered series might be more to my tastes now that I'm older, thanks for the review! I don't usually read books that have to do with horses, or animals in general, as central parts of the plot. I don't know if I'd like Saddled With Trouble. I have some teens who are looking for horse books. Thanks for this review. Just 8 followers more and 200! I have always love books with horses in them! And there is a mistery too! They both sound like great mysteries. Thanks for the post. Good review. You can never go wrong with a good mystery. I just love mystery books! I have not heard of these two books. Thanks for the heads up! The only horse book I've ever read was Black Beauty in the 4th grade. I think my aversion to horse books may come from that book being so sad! Hmmm... I'm not so much into horse books, but I love mysteries, so I could probably try this one. This book seems different to what I would usually read. Though mysteries tend to be good reads,but I'm really intrigued about the wine lover's mystery series. I love animal books, altough I've never really read many horse books. I always get frustrated wishing that the horses were actually unicorns. And then they aren't. This sounds good, though. with romance, mystery, danger, and suspense, I might forget about the unicorn thing. A book with horses sounds great. I love to ride and feel free. I read and reviewed Zamora on my blog and thought it was pretty good. Later on though I gave it to dh to read to our son as his bedtime story and ds absolutely loved it! Wanted to know if there was a sequel, but sadly I had to tell him no. I hadn't heard of Saddled with Trouble but I've seen Zamora's Ultimate Challenge round the blogosphere, I just didnt realise they were the same author LOL. Thanks for the heads-up! This doesn't really seem like something I would read, but nice review. I try to keep myself open to new books, but I really do doubt that I would consider getting this. The Zamora cover is so spooky! Saddled with Trouble sounds good. Reading your blog I always discover new titles, which can never hurt! I know at least 3 students who would devour this book. Never heard of these! Thanks for mentioning them! I wanted a horse when I was younger. Now I don't want the work, hahaha. Good reviews!